A clutch of East Sussex residents have been recognised in the New Year’s Honours list. Dr Glynn Jones, a deputy lieutenant for East Sussex and who lives in Hassocks, and member of several not-for-profit boards also receives a OBE for services to the community in Sussex. Steven John Berry from Hastings and team leader at Department for Transport, receives and OBE for services to Local Transport Resilience. Kathy Ann Gore from Uckfield, a deputy lieutenant for East Sussex, receives her OBE for services to charity and to the community in East Sussex, particularly to Hospice Care. William Benedict Nicholson, a screenwriter and author from Lewes, for services to Drama and Literature. He has worked on films such as Gladiator and Mandela: Long Walk To Freedom. Professor Janatha Hetherington Burns from Wadhurst and head of School of Psychology Politics and Sociology, Canterbury Christ Church University, receives an MBE for services to People with an Intellectual Disability. Jennifer Mary Clark, from Forest Row, the founder of Sussex Bat Hospital receives an MBE for services to Bat Conservation in the UK. Sonja Le Vay from Crowborough, has been given an MBE for services to the community in East Sussex. Beatrice Helen McBride. Formerly director of Policy and Communications British Heart Foundation. For services to cardiovascular healthcare in East Sussex. Carolyn Mary Randall of Cross In Hand, area manager Crimestoppers Trust, Sussex, receives an MBE for services to Crime Prevention. Giles York, Chief Constable Sussex Police, receives a Queen’s Police Medal in the list. Elsewhere, the creators of the spectacular sea of poppies that engulfed the Tower of London and touched the hearts of millions this year have both received MBEs. Paul Cummins and Tom Piper have been honoured in recognition of the immensely popular Blood Swept Lands and Seas of Red, which saw 888,246 ceramic poppies progressively fill the moat at the Tower. The artists are among 1,164 people recognised by the Queen in this year’s list, which also include honours for actors Joan Collins, James Corden and Sheridan Smith. The poppies emerged as one of the most visited and acclaimed public art installations for years, drawing an estimated five million visitors between July and November. Other prominent figures honoured this year are Esther Rantzen, actors John Hurt, Kristin Scott Thomas and Emily Watson, comedian Meera Syal, novelist Ali Smith, Poet Laureate Carol Ann Duffy and designer Mary Quant. 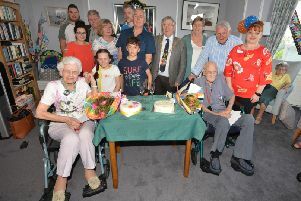 From the world of sport, former athletes Steve Cram and Dame Mary Peters, and Hillsborough campaigners Margaret Aspinall and Trevor Hicks are among those recognised, along with 103-year-old marathon runner Fauja Singh. Former lord mayor of London Fiona Woolf, who resigned from her role as chair of the inquiry into historic child abuse, is given a damehood for services to the legal profession, diversity and the City of London.